“Can dogs count to one million?”: Eve Allin writes a jagged, dog’s-eye response to the story of a girl and her best friend. 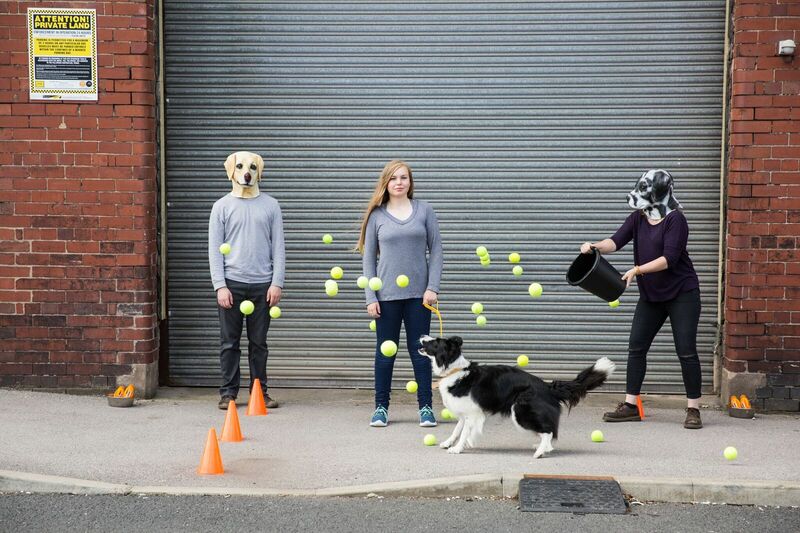 Katie & Pip at Summerhall, as part of the Edinburgh Fringe 2018.
can dogs count to one million? can i count to one million? Pip is a border collie. she is trained to save Katie’s life on a daily basis, which is good because Katie has type 1 diabetes. it is an invisible disability. that means you can’t see it, but it doesn’t mean it’s not there. Katie is the youngest of 6 children. she was born without a pancreas. that means that every day she needs to monitor her blood sugar levels. Tin Can People – that’s Robert and Charlotte, have decided to make a show about Katie and Pip. they want to raise awareness of type 1 diabetes, but also of all kinds of invisible illnesses. they speak clearly, and with purpose. they tell us what they are about to do. they repeat stuff, and they wear dog masks on their heads. would you like a kit kat? well done pip. you’re doing so well. you’ll have to try and stay alive for the rest of your life. that’s what the doctors said to Katie when she found out she had type 1 diabetes. they ask lots of questions and they tell you lots of things. that’s what doctors do best. when i was young i had to visit a doctor for my allergies and i called him nice doctor lovely doctor. i hope Katie had a nice doctor. in order to honour Katie, Pip, Charlotte, and Rob, it felt right to write the review like this. the show is jagged around the edges a lot of the time, balancing between fun and fear; a bit like life for Katie and Pip. things are a bit weird sometimes, and it isn’t always easily explained. it doesn’t let you sit comfortably, even when you are stroking Pip. and that’s a good thing, because we need to be a bit on edge, like Katie is. In the play Beginners, by Tim Crouch, there is a monologue which is written and performed from the point of view of the dog. Her speech is quick, excited, endless, rhyming, delighted, confusing, nonsensical. That monologue is sort of how I see Katie and Pip. It’s the extended cut. I’m never quite sure if it’s Katie speaking, or Rob, or Pip, or Charlotte. They’re a unit. They’re tuned into each other the way Katie and Pip are. This show feels so unique because it is as heart-warming as it is unsettling. It tends to itself in a controlled and affectionate way. We are never quite sure what it’s doing, but that’s kind of okay. Katie and Pip are not really ‘performers’ either – they are just being themselves in ways only a border collie and a 15 year old girl can. That’s how the liveness works too. It’s not in the script or in the audience, it’s in Katie and her medical assistance dog – both are precarious in their own ways, and both unpredictable too. The show doesn’t end, because Katie will always have Type 1 Diabetes, but also, it never really began either. I like to imagine Katie and Pip are always playing, always running through tunnels and pelting balls at each other, sometimes Rob and Charlotte are there too. Katie & Pip is on at Summerhall until 12th August 2018. Click here for more details.